The ideal scenario is where your opponent has 8 health, a giant, and a Sylvanas Windrunner, and you have this guy that somehow survived 1 turn (because the chances of having this guy on board against someone who has neither minions nor removal are nearly zero). It either wins the game or kills an annoying minion without any backlash. Considering how rarely this happens, I think its safe to say this card is yet to find its place. Card actually isn't that bad in Arena, and shouldn't be ranked that low in HearthArena in my opinion. I've lost games against it and won with it too. The 50% miss/hit is interesting in Arena as different opponents treat it differently. Some people actually spend two cards in killing it. Some people disregard it (but then takes 8 damage to the face, or it happens to trade for two cards eventually anyway). On paper this card looks horrendous, but in play it has interesting interactions in Arena provided you play him at the right time. Plenty of 4-5 drops only has 4 attack, and requires a ping or reach to kill. Weapons isn't really a good removal against this guy, since they're still taking 8 damage to the face (and oh yes, a paladin lost the game because of it). Certain removals can't get rid of it and would need additional ping to do so. Basically, when this guy trades for two cards (or at least one card + reach), this card becomes actually quite decent. It isn't piloted sky golem by any means, but HearthArena right now is rating this at like 20-30 ish? It's definitely not *that* bad. If it can bait out poly morph or flame lance, you're still at a good spot. This card is one the cards I mentioned in my "Worst Cards of TGT" Thread. I guess Blizzard forgot to give this card added stats for the negative effect. Salty Dog is a pretty terrible card and this guy is 1 mana more with the Ogre effect for +1/+1 that dont change the fact that this guy will be attacked and killed by Magma Rager, or even attack it itself. The more i talk about this card the worse it seems to me. This is bad. Really bad. Silver Patriarch level of bad. Ogre Brute is a 4/4 for 3, or 8 stats for 3 mana. That is better than the Spider Tank with 7 stats. Ogre Ninja is a 6/6 stealth for 5. It has 12 stats for 5 mana. That is better than the Stranglethorn Tiger with 10 stats. Dunemaul Shaman is a 5/4 windfury for 4 with overload 1. Even with overload it is cheaper than the Windfury Harpy. 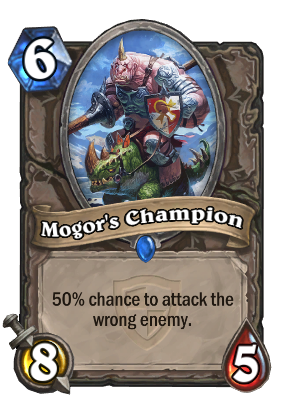 Mogor's Champion is an 8/5 for 6, or 13 stats for 6 mana. That is *not* better than the Boulderfist Ogre with 13 stats. Ogres: The only ones stupid enough to not care about taunt. Is this better or worse than Core Hound ? Can't tell.. I vote worse. Suppose you get the dream, and your frail attacker (whichever one) lives to see one turn. The Core Hound can go face for decent damage. This will just whiff and kill itself. yeah i think you're right, this card is terrible! I have no idea why this horrible boy exists. If you wait a turn, you can play a Corehound. Corehounds hit 100% of the time for just one mana more (now THATS what I call value!). But no one plays Corehounds, so why would you play this?